Delightfully perfect for lady! Fascinator headband soft yet classy. The color is a very soft , and fascinator hat is extremely versatile. This is great with casual couture, as well as semiformal occasions. 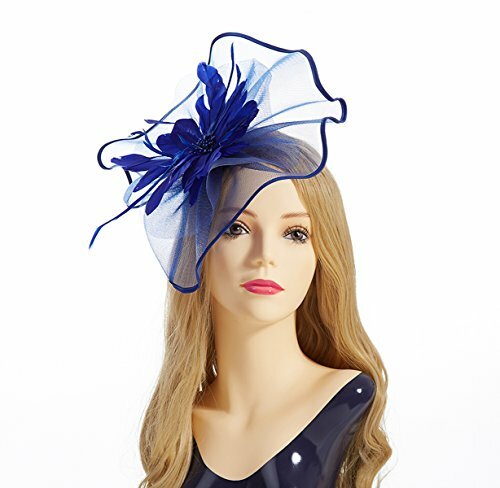 Fascinator Hat particular design and fabric looks and feels delicate and ladylike. Bring your derby hat and go to the party!! ♥【Material】:Polyester/Feather,Made of high quality Polyester,feather and mesh, lightweight and stylish. ♥【Size】:Diameter:29cm-11.5inch.Fits most head girth,trendy style matches everything,comfortable and classical. ♥【Indispensable】:Show elegant and charms,It's the perfect ladies church hats,fascinator hats pillbox,derby hats,wedding hair accessory for women to wear to a British themed Tea Party, Kentucky Derby Race, Garden Party,Wedding,Easter and Church,20s party,flapper events, cocktail party, fashion show, carnivals, performance or any events. ♥【Premiums Gifts 】:The fascinator will be a great gift for your daughter, mother, grandmother, friends, sisters, colleague and yourself on Valentine's Day,Halloween Costume,Christmas and Vintag. ♥【Practical】: Headwear comes with a headband and a crocodile clip,Headband sturdy and easy to wear. If you have any questions about this product by Aiskki, contact us by completing and submitting the form below. If you are looking for a specif part number, please include it with your message.